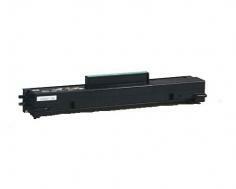 The Muratec MFX-1300 is a printer / fax combination that incorporates scanning and copying functionality. The unit is ideal for either a home or an office, and installation and setup is fairly straight forward and takes very little time; somewhere in the neighborhood of 15 minutes. The unit can be connected to either a single host PC or a network via a 10/100 Ethernet connection. Additional connectivity options are available separately. The Muratec MFX-1300 has a fairly good feature set for a small office multifunctional device. The unit's feeder tray has a 50 sheet capacity, which is a step above some unit's single sheet bypass slots, while standard paper capacity totals 550 sheets. Expansion options allow up to 1,050 sheets of maximum paper storage. 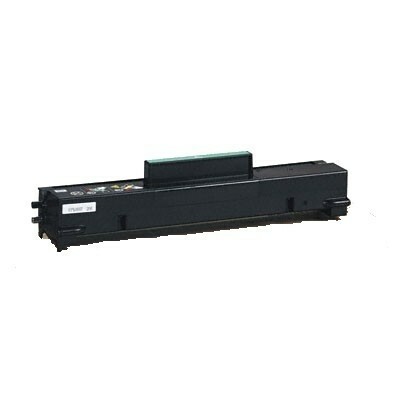 OfficeBridge Online can be installed on the Muratec MFX-1300 to boost scanning, network printing, and desktop faxing performance. Multi access operation is fully functional in the printer, and allows for multiple functions to be performed at once via a network connection. These functions can include printing, copying, scanning, and faxing simultaneously wherever hardware is available. Photocopying abilities are also above average for the device. Sorting and stacking can be done automatically, and features such as positive and negative copy can be used to adjust ink usage. Zoom increments can be as small as 1% and a pre program job function helps to speed along frequently used copy settings without reprogramming. A 50 page automatic document feeder is included, and can be crucial when dealing with multiple page copies, scans, or faxes. 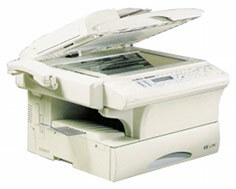 The fax machine comes with some convenience features such as broadcasting, one touch dialing, and group dialing. The size and weight of the unit are decent, and the device could easily be considered a desktop unit. It could certainly be considered for the home office. The Muratec MFX-1300's print speed is only 13 pages per minute for a standard letter sized print. This is almost unacceptably slow by today's laser printer standards. Included memory is also low for a network multifunctional device with not only a poor 8 MBs of memory to begin with, but expansion options maxing out at only 16 MBs. The unit's modem is also very slow at only 14.4 kbps compared to the current standard of 33.6 kbps or even the occasional 56 kbps. Fax memory is also only 8 MBs expandable to 16 MBs, due to memory sharing. Ultimately, the machine is dated, and the output capacities and maximum print volumes limit the unit's effectiveness for any environment other than a very small office. If the unit could be purchased at a bargain, then it might be worth considering. Review it: "Muratec MFX-1300 "
A convenient toner save mode allows users to manually adjust toner usage to reduce overall cost per page, while the toner cartridges themselves are of high quality. 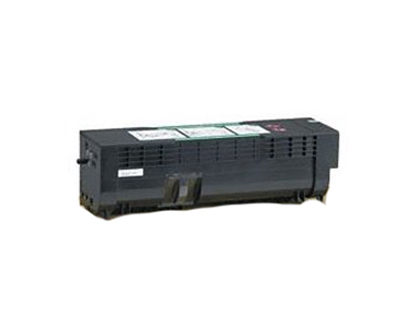 Interestingly, the drum unit for the Muratec MFX-1300 matches the toner cartridge in page yield, making it convenient to swap out both, simultaneously. Both toner and drum have a 16,000 page capacity.